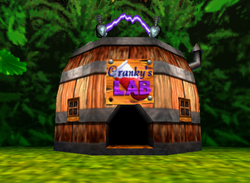 Cranky's Lab is Cranky Kong's abode in Donkey Kong 64. The interior consists of several strange potions and a computer on a counter, which Cranky Kong stands behind to speak to the Kongs. It appears in all of the levels on DK Island, except for Hideout Helm. Here, the Kongs can purchase, for a certain amount of Banana Coins, special potions concocted by Cranky to learn special attacks, ranging from Simian Slam to Hunky Chunky. If the Kongs have obtained 15 Banana Medals, they can play the classic Rare title Jetpac on Cranky's computer, which has the Rareware Coin hidden within. Three out of the five Kongs momentarily receive physical changes after drinking the potion before reverting back to normal: Lanky Kong's head enlarges a bit and causes him to fall backwards, but shrinks back down to its original size after he removes the potion from his mouth; Tiny Kong's torso and limbs shrink and then she spins around and then she falls backwards, and then she enlarges back to their original sizes right before the potion bottle breaks; and Chunky Kong's torso and limbs inflate and in the next few seconds deflate back to their normal shapes. The only Kongs to remain normal without any physical changes to themselves while drinking the potion are Donkey Kong and Diddy Kong. This page was last edited on January 29, 2019, at 03:24.